The perfect outdoor oasis is a common goal for any homeowner. We all want to feel connected to the outdoors. We want an easily-accessed retreat for those harder days that beat us down. We want space to gather with our friends and family members. We want to sit and watch as our children play in the backyard. Outdoor spaces are important to us. The patio door you choose for your home lends a huge hand in creating the perfect outdoor space for your family. Of course, there are many styles from which to choose to compliment any home aesthetic and personal preference. Choosing can feel overwhelming! 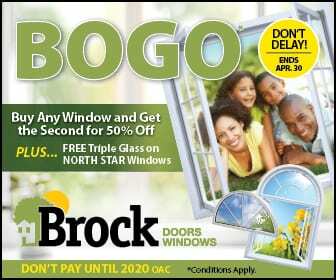 Why not make it easier on yourself and come to Brock Doors and Windows here in Toronto, ON, and let us help you choose? From the style of patio door to the little details like hardware, accent windows, and sidelites—we will help you complete your outdoor space to your specifications. Further, we will show you how your Brock patio door can help you “go green,” attain peace and quiet, and lower your energy bills year-round. We have been in this business for nearly thirty years. We know how to tie your preferences, budget, and needs together seamlessly. Our experience includes over 70,000 quality installations in and around the Toronto and GTA and we are proud to say our thousands of happy customers would agree: Brock knows how to give your home the exact look you want. When we meet for your free consultation, we will evaluate your space, your needs and aesthetic goals, and your budget. Are you worried your space won’t allow for the patio door you want most? Don’t be! We have so many options to help you attain the perfect look. Do you want to add sidelite windows to accent your new Toronto patio door? We have you covered and can’t wait to get creative with you. Ready for your perfect outdoor oasis? Give Brock Doors and Windows a call!